Now here's a strange little number: a quasi-savage made-for-tv movie from the disco decade. 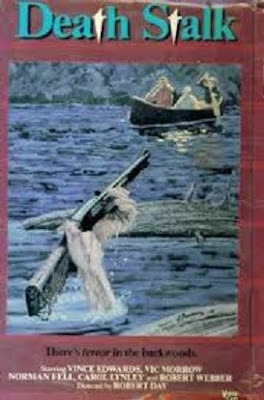 However, a better name for Death Stalk might actually be The River Mild, since it's the generic and overly familiar story of psychotic prison escapees attacking white-water rafters on a dangerous river. Deliverance (1972) or even The River Wild (1994) remain scary to this day (just say the words: "squeal like a pig...") because they're intense films wherein man battles harsh nature as well as his fellow man. Yet this TV variation is a watered-down, white-bread version of the same brand of material. Yes, this was made for TV at about the time of Nixon's resignation, meaning there was strict censorship in terms of what could be depicted on screen, but Death Stalk still lacks both subtlety and artistry. Think of other great 1970s TV movies. Don't Be Afraid of the Dark, Bad Ronald, Gargoyles, and Someone's Watching Me all leap to mind, right? The oddly-titled Death Stalk isn't in the same league. It filled a 90-minute slot in prime time, but precious else can be said about it. The movie is filmed in generic terms: the river, the mountains, even the violence conducted on the rafters...it's all genuinely...mild...and lacking distinction. 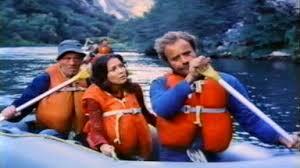 Death Stalk finds two suburban couples rafting on a dangerous river for the weekend. A common refrain early in the film is "don't forget the booze." Anyway, there's Pat (Anjanette Comer) and Jack (Vince Edwards); and Kathy (Carol Lynley) and Hugh (Robert Webber). 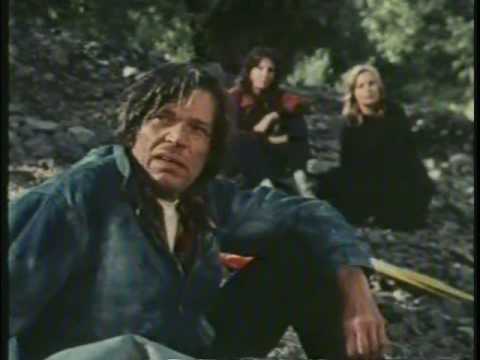 They're all enjoying their weekend nature excursion when suddenly they run afoul of four escaped convicts from the nearby penitentiary (in 1970s "bleeding heart liberal" lingo, a rehabilitation center). In a great bit of seventies casting, the nasty convicts are played by Combat star Vic Morrow, CHiPs star Larry Wilcox, Three's Company's Mr. Roper (Norman Fell) and the psychotic Neville Brand of Eaten Alive (1976) fame. Anyway, the convicts tie up the men, and head up the river with the women in tow. "I've been in jail so long I was starting to believe the greatest smell in the world was coffee," a lecherous Shepherd (Brand) says, menacing Lynley's Kathy. And that's just part of Death Stalk's 1970s-era sexual underpinnings. Pat quickly falls for the leader of the convict pack, Morrow's Brunner. She steals a moment with her fellow captive and suggests to Kathy that they should *ahem* submit to the men. These two women have an in-depth conversation, in fact, about granting sexual favors to the convicts in order to stay alive. When Kathy reacts with horror at this thought, Pat gets offended and says Kathy should be down with the arrangement since she "played around" before marriage. In another weirdly sexist touch, the women are treated by their husbands as inferior, materialistic creatures. One of the husbands urges his wife to row the boat faster, and if she does so, he'll buy her a "new dress." Anyway, Hugh and Jack follow their missing ladies up the river in their supply raft, but Norman Fell turns the tables and waits for them with a rifle, and tries to pick them off. During the battle, Hugh -- the corporate boss -- proves himself a coward. Jack, by contrast, proves he's got the stuff to kill when driven to murderous rage. Imagine how that reckoning could play out in Deliverance, or a Wes Craven movie. Keep imagining, because here the resolution is just plain bland. Death Stalk progresses with a washed-out visual palette, and director Robert Day seems unable to establish the river's geography, or the character's positions on the river. A consequence of this old-style TV thinking is that the climax falls to generate any excitement, or even a raised pulse. Jack catches up with his wife Pat, and finds her getting it on with Morrow's character. Then they all stare intently at each other. Pat whimpers a little bit. Then the credits roll over imagery of the river. Anyway, as longtime readers of my work know, my favorite kind of horror movie is "the savage cinema" of the 1970s. I'm talking about revenge movies like Straw Dogs (1971), Deliverance (1972), The Last House on the Left (1972), The Texas Chain Saw Massacre (1974) and The Hills Have Eyes (1977). These movies concern random violence perpetrated on unsuspecting victims; wrong turns of fate and destiny; and those same characters (or the survivors anyway...) finding the interior mettle to stand up to the pure, unadulterated horror. Death Stalk comes from the same time period in Hollywood history. But being made for TV, it lacks teeth. And, truth be told, it's pretty dull. And "seventies sexist" to boot, to quote Joss Whedon. It's probably my cinemasochism talking but sir, your negative review has paradoxically earned this a place on my watchlist! I have a soft spot for "watered-down, white-bread" TV variations on popular themes (SNOWBEAST anyone?). 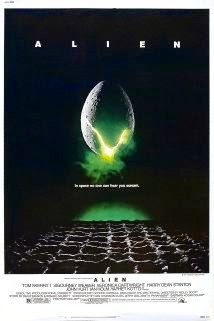 And that poster! Such a shameless ripoff of the iconic DELIVERANCE poster almost dares you to watch it! Never heard of this movie and while I have no doubt that it's as sub-par as you make it sound, I kinda want to see it, now.